The Brazilian Federation of Banks (FEBRABAN) and the Center for Sustainability Studies at the Getulio Vargas Foundation (FGVces) have established a partnership that is now in its fourth cycle of activities to analyze the possible ways to leverage the transition towards a Green Economy in Brazil by using resources intermediated by the National Financial System (NFS). Throughout this fourth year, four studies were conducted, three of which are a sequel to the studies started in the previous year. The first one analyzes the economic-financial feasibility of adopting photovoltaic systems in Brazil to determine the scalability of financing such projects. The second study intends to evaluate the economic-financial feasibility of financing models for the recomposition of Legal Reserve Areas (LRA) where economic exploration is possible. The third study aims to analyze the implications and risks for financial institutions of deforestation on the livestock, soybean, wood products and palm oil supply chains. Finally, the last study, which starts a new line of research, addresses the climate risk management by banks and companies, with emphasis on risks and opportunities related to carbon pricing. 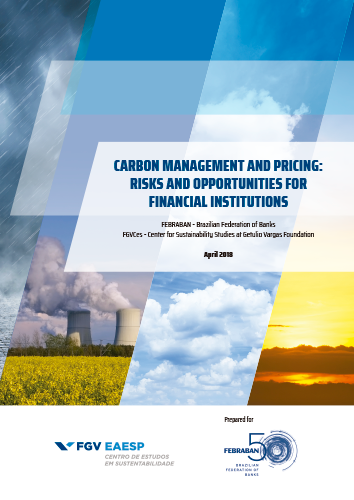 This report presents the last study and seeks to identify trends related to high carbon emissions and concentrations, including risks and opportunities derived from pricing; map the practices of carbon risk management by companies of selected economy sectors; and identity relevant sector-related topics to be considered by financial institutions upon managing the carbon risk in their analyses of socio-environmental risks. The research was carried out through: i) bibliographic review, in particular with respect to risks related to climate change and its impacts and carbon pricing (mandatory and voluntary); ii) documentary analysis of Brazilian companies participating in the CDP Climate Change, a program in which public companies report information related to climate change and its connection with business strategy in the CDP public platform; iii) interviews with international banks involved with carbon risk management topic; iv) interviews with companies operating in Brazil, which adopt carbon risk management practices; v) discussions with FEBRABAN members; and vi) internal discussions of FGVces team.